As fall gets into full swing and temperatures all across the country begin to drop in preparation for winter, homeowners are turning on their heating systems in an attempt to battle the impinging cold weather. Those of us who use electronic heating systems will know that we are in for bigger bills than those who use gas in the latter half of the year but electric heating is often cheaper than people realize. Most electricity companies offer a variety of tariffs and this allows home owners to pick an option that saves them money. A popular tariff for people who use electric heating is cheap night rates. These night-time tariffs were designed with storage heaters in mind and if you use storage heaters (large electric radiators that store heat in ceramic bricks and release it slowly throughout the day) then these tariffs can indeed be a money saver. The problem is though; fewer and fewer people use storage heaters these days because they are bulky, heavy and not very pretty. Electric radiators are far more common and these radiators use the same amount of electricity regardless of the time of day; so people who have changed their heater but not their tariff will be paying too much for their electricity during the day. If you use radiators make sure you are on a standard tariff or a tariff that offers savings when you are most likely to be in your home. The radiator you choose can also have a massive effect on how economical your heating can be. The material your radiator is made from will affect how quickly it can disperse heat. Reaching an optimum temperature quickly allows the radiators thermostat to start economizing electricity use faster. This makes the radiator more economical overall. One of the best metals for conducting heat is aluminium. 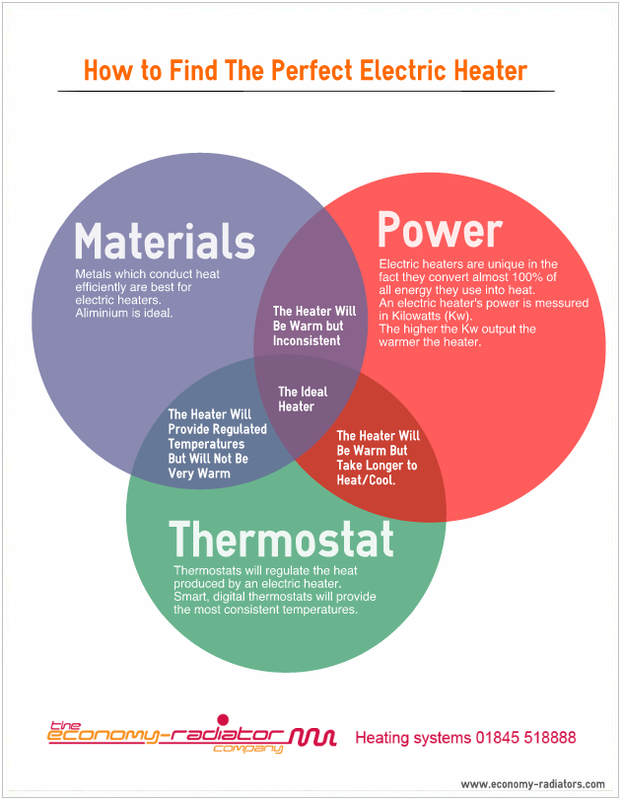 The power of your radiator will also determine how economical it is. If you buy a heater that is too weak you will need to run it more often and if you buy a heater that is too powerful you will waste electricity. To figure out how powerful your radiator needs to be simply multiply the length, width and height of your room in metres and divide this number by 14; the number you are left with is how powerful your radiator will need to be in kw (kilowatts). This is because 1kw of electricity will heat 14 cubic metres of space to a comfortable temperature of 22°C. Lastly, the thermostat in an electric heater is important because this is the only way one electric heater or electric radiator can be more economical than the next. Electric heaters convert 100% of the energy they use into heat; so the more effective the thermostat, the less electricity the heater will use and the more economical the heater will be. Heaters with poor or no thermostat will use the same amount of electricity constantly providing an inconsistent heat and producing higher electricity bills. By choosing the correct tariff and the correct heater you can heat your home electronically and still save money.